This article is 2557 days old. 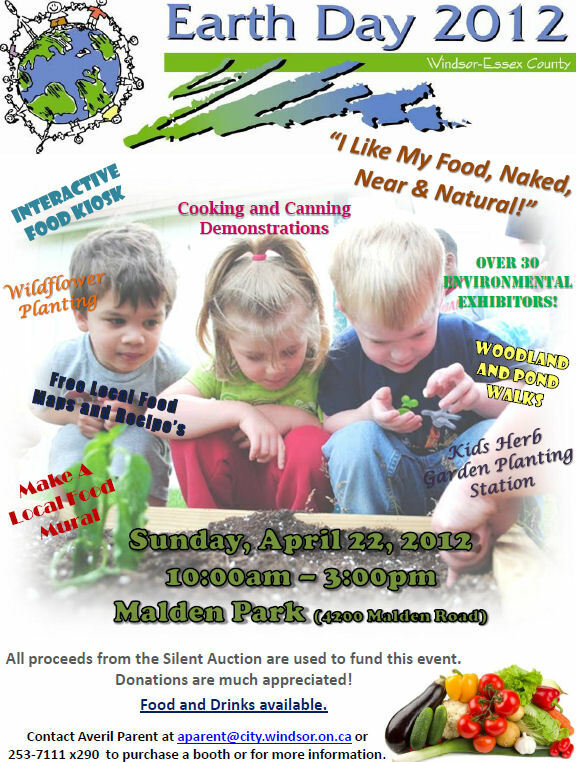 This year, Windsor’s Earth Day activities move to a new home at Malden Park. This year the Earth Day Committee is focusing on bringing fresh ideas to Windsor by introducing the many environmental benefits to locally grown, organic food with several activities planned. Those include an interactive food kiosk with local chefs, a local food map of Essex County, local chef’s recipe cards, a canning demonstration and local food cooking demonstrations. Other activities include fun with Let’s Talk Science, clay pottery with Alice Sacharoff and Woodland and Pond walks, and Beebo will also be on hand for the kids. There will be forty environmental exhibitors including local food producers, chefs, educational booths on the food cycle, composting, native species, and many more! Earth Day runs from 10am to 3pm, with The Friends of Ojibway Prairie running a meadow planting at Malden Park from 1pm to 2:30pm as part of the day’s activities. Bring a shovel!